Keith asked the following question: "I have been asked to identify the station in this photograph, which bears the name of a photographer in Watford. It is likely therefore to be in that area. It appears to me to be just a goods and parcels receiving office, away from a station, with an LNWR horse bus service to it. Are you by any chance able to identify the photograph?" I think this may be Marlowes Post House in Hemel Hempstead at the junction of The Broadway and that drinking fountain looks very familiar! Click here for further details. 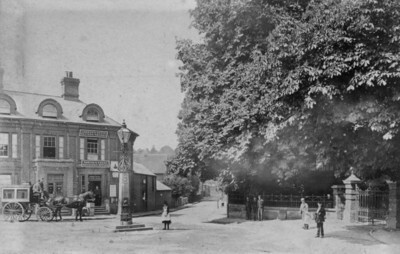 Martin's identification of Hemel Hempstead is confirmed by OS plans, but the fountain and the building housing the L&NWR Parcels Office have long gone; a traffic roundabout now occupies the site. The view is looking south-west down Bury Road, now renamed Queensway. The black & white buildings in the other picture are still there, visible on Google street views. It's important to have a good look at the original photo before we can confirm Martin's idea. The main items to look at are the water fountains; they are so different. This photo query is very much unsolved. As Alan points out, the fountain is quite different in the two photographs but other details - the angle and shape of the prominent building containing the L&NWR office, the layout of the gate and its fence on the right, the view down the street with the roof of a large building in the background, all seem to fit the old Ordnance Survey plans very closely. The large background roof seems to match a "Drill Hall" on the old plans. 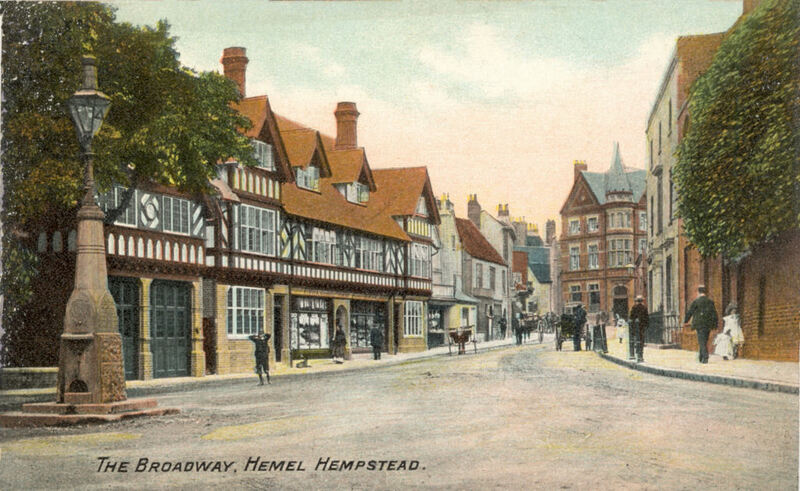 If this isn't Hemel Hempstead it is very difficult to think of where it could possibly be. So perhaps the fountain was moved and remodelled at some time before it was finally taken away?